In mid-January, B.C. government officials trucked the last survivors of an endangered mountain caribou herd into a pen near Revelstoke. 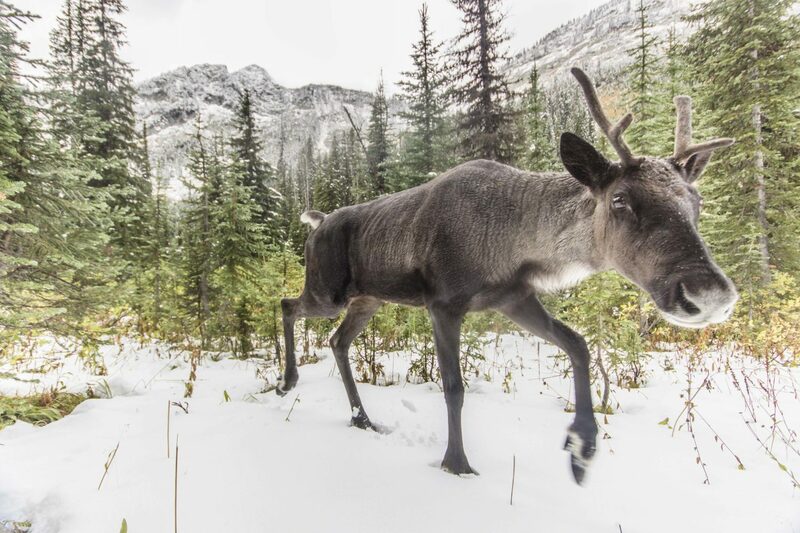 The elaborate rescue operation, which included two helicopter rides for the tranquilized animals, marked the official disappearance of the South Selkirk caribou herd from the landscape it had inhabited since the end of the last Ice Age. David Moskowitz, a Washington-state based author and photographer, followed the demise of the transboundary herd. His new book, Caribou Rainforest: From Heartbreak to Hope, explores the rare and threatened rainforest that was home to the South Selkirk population and on which many imperilled caribou herds and a myriad other species depend. Moskowitz is on a tour to highlight this iconic animal and remarkable landscape, starting with an event in Victoria on February 9. The Narwhal asked him about his connection to caribou and his hopes for the future. A subalpine forest and wetland in the Monashee Mountains, typical summer habitat for mountain caribou. Why did caribou appeal to you as a book topic? The book is an exploration of an ecosystem, with mountain caribou being the ambassador for the ecosystem. The goal of this book was to put the inland temperate rainforest on the map in a bigger way. The caribou rainforest, as we’re calling it, is a globally unique ecosystem that many, many people don’t even realize exists. Can you describe this ecosystem? The caribou rainforest is the only significant remaining inland temperate rainforest on the earth. It’s the headwaters of the Columbia and Fraser rivers and little bit of the south end of the Peace River and the upper end of the Hart ranges. It’s essentially a stacked series of mountain ranges in the interior of British Columbia and the Pacific Northwest. Temperate rainforests are much rarer than tropical rainforests, and temperate rainforests that form in the interior of the continent are found nowhere else in the world in any significant quantity except right here in the Pacific Northwest. It is literally one of the most unique terrestrial ecosystems on planet Earth. How did you arrive at the title for the book? It was our goal to put the ‘Caribou Rainforest’ ecosystem on the map in the same way that places like the Great Bear Rainforest, the Amazon, the Serengeti, or the Florida Everglades are places that people far and wide recognize as ecologically unique, stunning ecosystems worthy of protection. I feel like the ‘Caribou Rainforest’ is a name that people can connect to with their minds and their hearts. Ultimately it’s our sense of connection to the places we depend on for our survival that will save those places and ourselves. What are the biggest threats facing the inland temperate rainforest? Climate change in is a growing threat to the integrity of this ecosystem. Habitat fragmentation due to logging and road-building has been probably had the biggest impact on this ecosystem. Mineral development has also been an issue. Because this ecosystem is so wet it rarely has burned in the past. So there are places that have been undisturbed since the end of the last Ice Age. It was the vast tracts of old-growth forest that allowed for species, and for mountain caribou in particular, to survive and develop a very unique lifestyle, [one that] that caribou have nowhere else in the world. Caribou need old-growth forests. Patchwork, high-elevation clear-cuts like the ones shown here in the Hart Ranges fragment the refuge habitat that mountain caribou depend on. Are the logs being hauled off to local mills and creating employment? Logging in the inland temperate rainforest in British Columbia is an industrial practice. British Columbia is currently managing this ecosystem as a factory model. Part of the driver is local employment but it’s not the primary driver. The primary driver is corporate profit. Lots of the ways this wood is processed are designed for efficiency of profit rather than local employment. This ancient forest in the Selkirk Mountains was clear-cut shortly after this photo was taken. The metal straps around the cedar tree keep the trunk from splitting when it is felled. The hemlock trees went to a pulp mill to make paper products. You’re American, so what is it in particular that has inspired and intrigued you to spend so much time in the Canadian part of the inland temperate rainforest? Roughly 80 per cent of this ecosystem is north of the border. I [went] from the top to the bottom of it, east to west, so that just means a lot of time in Canada. I was interested in mountain caribou and so I went to find and photograph these animals. I knew a little about them and thought they were cool. I knew the mountain ranges where they lived were beautiful. So I thought it would be a fun adventure. And pretty quickly, within the first few weeks of fieldwork, I realized how endangered they were and how deeply connected they were to this very unique ecosystem. We are continuing to liquidate this ecosystem at a pretty alarming rate, despite decades of theoretical conservation measures. It was just mind-boggling. I was driving up the road into beautiful caribou habitat and seeing the habitat coming down the road on logging trucks. We are logging old-growth forests in endangered species habitat in two of the most affluent and theoretically progressive countries on the planet. When you started this project there were about 25 animals in the South Selkirk herd, and now the herd is extirpated [locally extinct]. What was it like to witness that decline? The South Selkirk herd was my entrance point into this story. My team spent a lot of time trying to track down and photograph these particular animals because it really did highlight the international nature of this story. Following their plight through years of fieldwork has been very engaging and pretty challenging. People have asked me if I was surprised or shocked about the fate of those animals. What I’ve said is that it was extremely predictable. As soon as I got the broad brushstrokes of this story it was really apparent that that herd was heading towards disappearing. Without some massive effort to do something different, there was just no way that anything else was going to happen there. The fact that many people are surprised about that speaks to the fact that to some degree our culture has its head in the sand as to what’s happening in the world around us. When we really take a candid look at what’s happening, not just for caribou but for many other species and ecosystems as a whole, that’s what’s coming. The sooner we can look at that with clear, honest eyes and really sort out that business-as-usual is not going to get a different result the better off we’ll be. Has the disappearance of the South Selkirk herd resonated in the U.S.? That was the last caribou herd in the contiguous United States. It’s really a milestone in the Anthropocene. If you look at it through an ecological lens it’s just another day to some degree. But when you look at it through a human cultural political lens it really is a marker. The fact that it has garnered interest because of that really speaks to the nature of the issues that we face today. There’s a complete disconnect between ecological processes and human cultural processes. The remains of a bull moose that was killed and fed on by a pack of wolves in the Selkirk Mountains in Washington State. That herd has been going across the border between Canada and the U.S. for millennia, long before the border existed. Can you speak to that and what it symbolizes? The herd lived in the southern Selkirk mountains. And the southern Selkirk mountains go across two states in the U.S. and take up a chunk of British Columbia and Canada. For them that was just their home. So, if we drew a map of the world as caribou see it, it would look very different than the one that humans see. One of my goals in the book was to try to help give humans the perspective of caribou and ancient rainforests, to help people see the world through the eyes of things beside humans, and through the eyes of humans other than those we naturally connect to through our own cultural histories. A lot of what’s happening in this ecosystem really lays bare the issues that we’re facing around the world. That includes things like the challenges you have to protect a single species when the ecosystem itself that it depends on is endangered. Do you think that the day will ever come when caribou are back in the contiguous United States? It’s not outside the realm of possibilities. I know for a fact there are many people south of the border — including Indigenous peoples from the Kalispell and Kootenai tribes that have treaty rights to have these traditional animals on their home range — who will force the issue with the U.S. government, that are going to be pushing for that. But I don’t think it’s by any means a guarantee. The future is dark and murky for all of us. Where do you find hope in all of this? The ending of the book really focuses on that particular question. The reality of it is that all of us, all these different creatures in this ecosystem are all after the same things. We all want a safe and rich and healthy environment to raise future generations of our family and our kin. When we recognize — and this is something I really got after talking to numerous Indigenous groups in the region — that we need to expand that nature of family, and expand that notion of who are the community members and family members that we need to tend to, there’s an infinite well of love and hope and desire to make things better. I really want to inspire people, to engage people, to help people understand how beautiful this is and also to help us look at the challenges we face today without getting overwhelmed or shutting off to the pain and tragedy of what’s coming so that we can stay engaged and can move forward to take action to create an alternate future. Venerable coral lichen (Sphaerophorus venerabilis) is one of several species of lichens that exists only in oldgrowth rainforest stands.